Watch the EBR2 put through a Fukushima scenario! The Experimental Breeder Reactor 2, an Integral Fast Reactor built at Argonne labs, ran a liquid sodium core. This can be safer than water, as the sodium coolant runs at room pressure rather than very high pressure water reactors need. If there is an overheating incident, the reactor core is sitting in a pool of liquid sodium that can dissipate the heat, carrying it away. 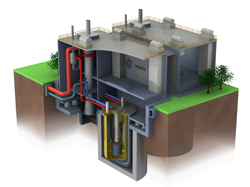 The pool-type reactor design of the EBR-II provides passive safety: the reactor core, its fuel handling equipment, and many other systems of the reactor are submerged under molten sodium. By providing a fluid which readily conducts heat from the fuel to the coolant, and which operates at relatively low temperatures, the EBR-II takes maximum advantage of expansion of the coolant, fuel, and structure during off-normal events which increase temperatures. The expansion of the fuel and structure in an off-normal situation causes the system to shut down even without human operator intervention. In April 1986, two special tests were performed on the EBR-II, in which the main primary cooling pumps were shut off with the reactor at full power (62.5 megawatts, thermal). By not allowing the normal shutdown systems to interfere, the reactor power dropped to near zero within about 300 seconds. No damage to the fuel or the reactor resulted. This test demonstrated that even with a loss of all electrical power and the capability to shut down the reactor using the normal systems, the reactor will simply shut down without danger or damage. The same day, this demonstration was followed by another important test. With the reactor again at full power, flow in the secondary cooling system was stopped. This test caused the temperature to increase, since there was nowhere for the reactor heat to go. As the primary (reactor) cooling system became hotter, the fuel, sodium coolant, and structure expanded, and the reactor shut down. This test showed that it will shut down using inherent features such as thermal expansion, even if the ability to remove heat from the primary cooling system is lost. 2. Watch the EBR2 put through a Fukushima scenario! We have about 400 reactor-years of real world data and testing with fast-breeders. These things work. Indeed, this next promotional video about the Integral Fast Reactor shows how old these passive safety technologies are. It’s 10 minutes long and shows how the IFR reprocesses nuclear waste for a re-burn, but at 7:30 it discusses the passive safety of sodium as a heat-absorber. Others have ‘neutron leak’. If all the best cooling pumps and backup generators money can buy are actually knocked out in some freak event, the reactor core fuel rods are designed to expand if they overheat. As they expand, the radioactive pellets get further apart until the reaction is no longer self sustaining. It shuts down. That’s automatic cooling, built right into the reactor core itself. These are fast-breeder reactors with good on site fuel reprocessing centres that are not quite integrated into the reactor itself, so it’s not quite an Integrated Fast Reactor. But these are still very good reactors. Japan paid a billion dollars for the technical specs on the BN-600! One that seems most ready for prime time is General Electric’s S-PRISM, an IFR based on the EBR2 above. It is small and modular so that components can be put on a production line. This will become an assembly line, mass produced nuclear reactor! The components are then be trucked to site for fast assembly. Putting nukes on the production line will standardise safety standards and reduce costs. The UK government nearly gave GE permission to build these a few years back, and there are other agreements working away in the background. Check the wiki for the latest.